Maui, the Valley Isle, has been a frequent vacation spot for quick, one week trips where we mainly relax. 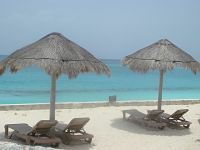 The pristine sand on the beaches encouraged our penchant for baking in the sun but as we got older, fearing a weathered look, we started exploring other activities. 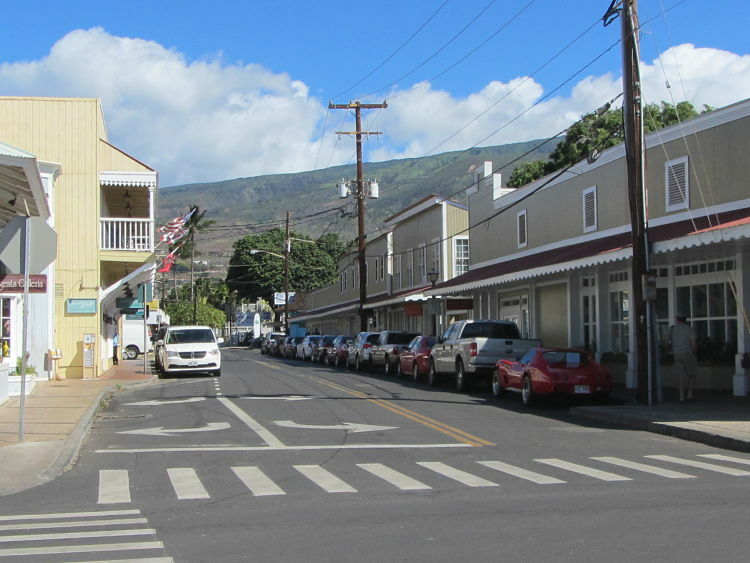 A good pastime is heading for Front Street in Lahaina and browsing in the shops. 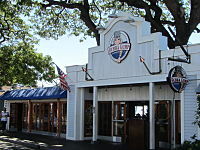 Lahaina is a seaport town that served as the seat of power for the Hawaiian monarchy for almost five decades until the mid-1800's. It was also an international whaling center in the 1800's. 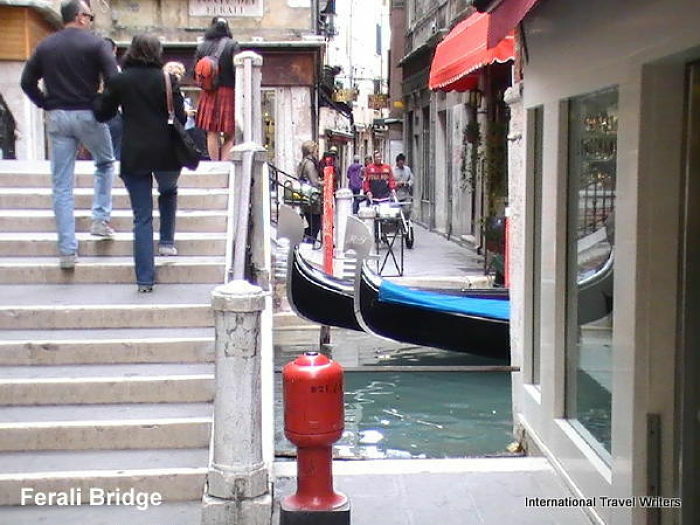 Now it houses modern shops, art galleries, and restaurants...to name a few. Maui County Transit runs hourly service ($1 a trip or $2 all-day pass on 12 routes around the island going to popular beach areas, restaurants and shopping malls. 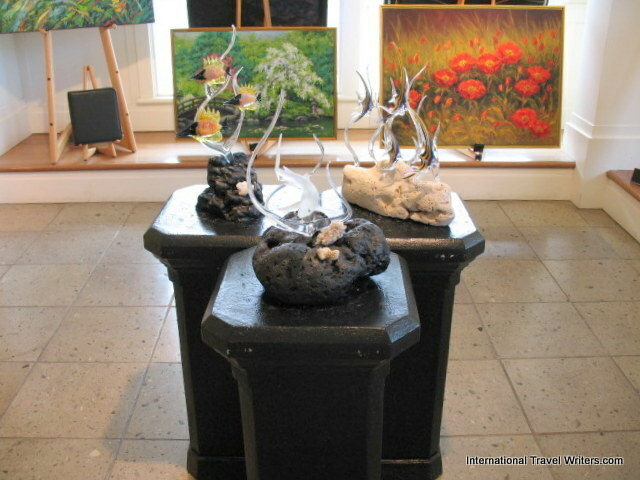 As we sauntered down Front Street , the main road in Lahaina, we stopped in galleries as well as window shopped. 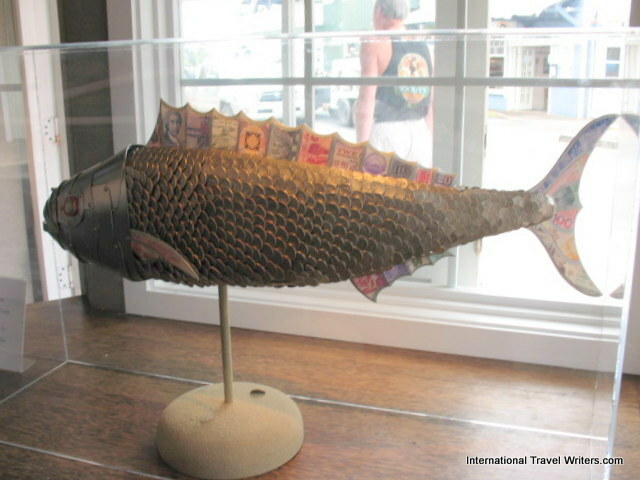 An unusual creation was the fish above that was done mostly in just copper pennies. Maui has some amazing and rather unique artists and a few are mentioned on my other page titled Maui Art. We saw a magnificent 4-masted schooner slowly passing the breakwater with its plumes of water spray and mist rising above it (photo above). 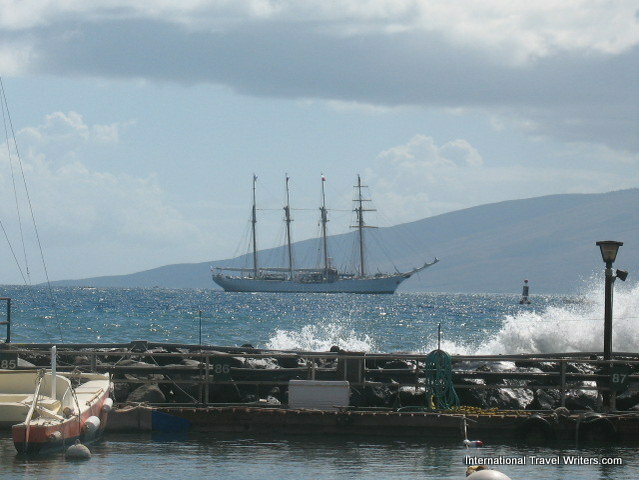 If you want to immerse yourself in some past history of the seafaring port of Lahaina, the Whalers Village Museum is certainly worthy of your attention. You can trace the historical past of this whaling industry town with all it's diversity and culture. Not all vendors are inside stores. With the warm, balmy climate usually being cooperative, home baked breads, pastries, and sweets are offered at outdoor stands. Chatting with the locals and trying their products helps to better understand their way of life. 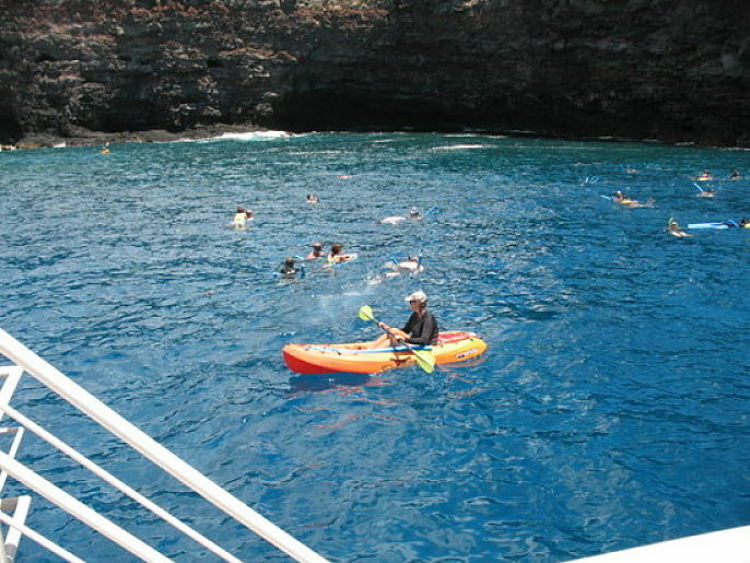 Although there are vendors selling numerous tours, the one that caught our eye was Pacific Whale Foundation's "Snorkeling in Molokini and Lana'i". Molokini is an extinct volcano crater about 3 miles off Maui's southwest shore. 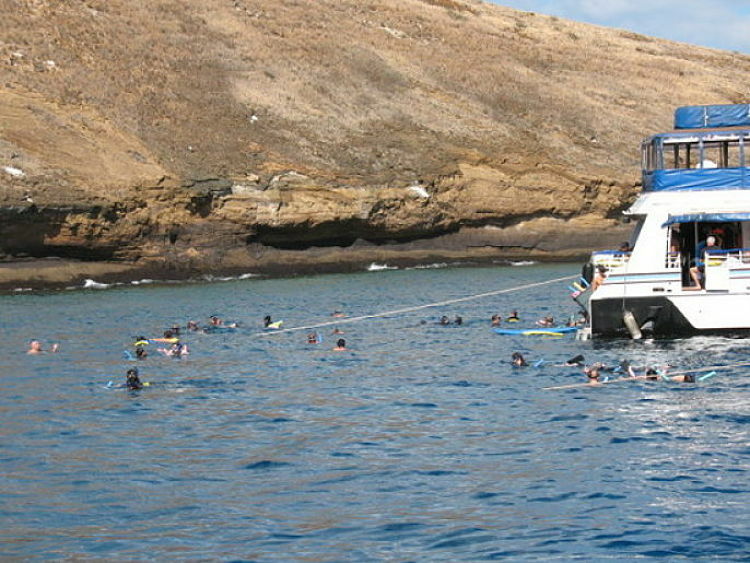 The snorkeling is done at the Molokini Marine Preserve. 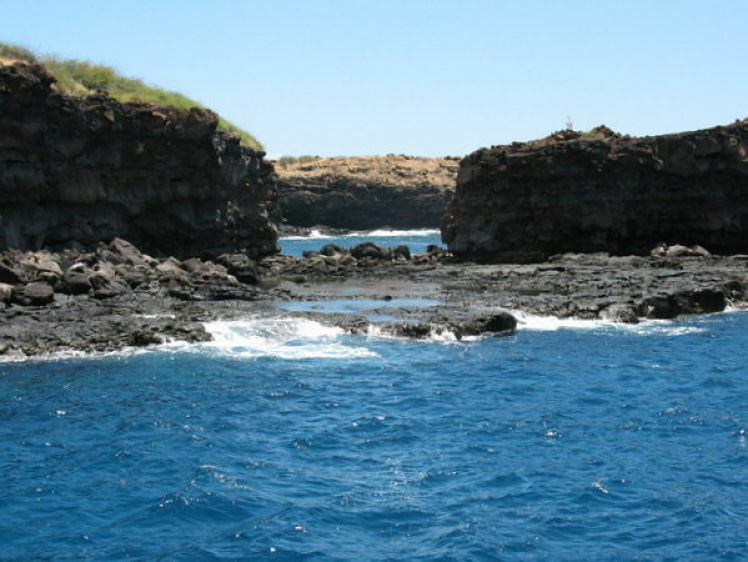 Then the tour takes you to the rugged coast of the neighboring island of Lana'i. There are famous reefs of colorful corals, fish and sea turtles. 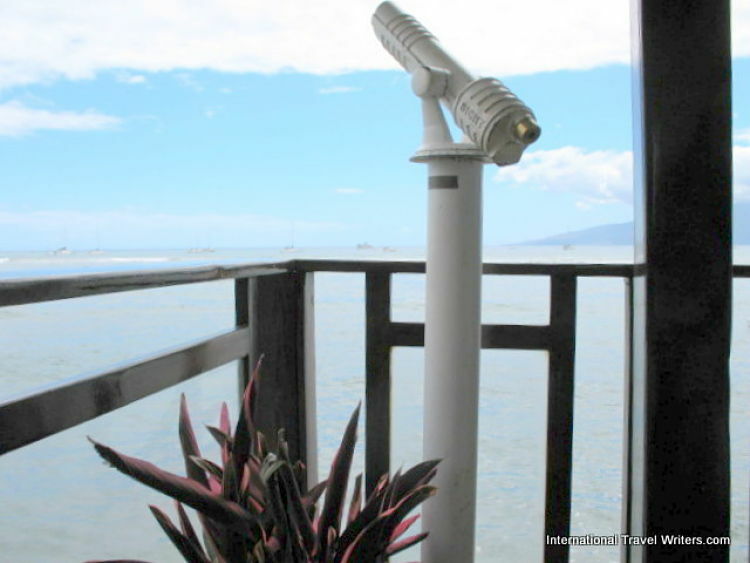 The adventure begins at Ma'alaea Harbor. Pacific Whale Foundation Ocean Discovery Store at Ma'alaea Harbor Village Mall is where you meet at 7:00 a.m. If you don't have a waterproof camera and wish to take photos of the underwater sealife and corals, you can rent one there. There are two decks. One is a shaded cabin with armchair seating and the second is a spacious upper sun deck with easy access swim steps and freshwater showers. All trips are led by experienced marine biologists who get into the water with you for a guided tour of the reefs. 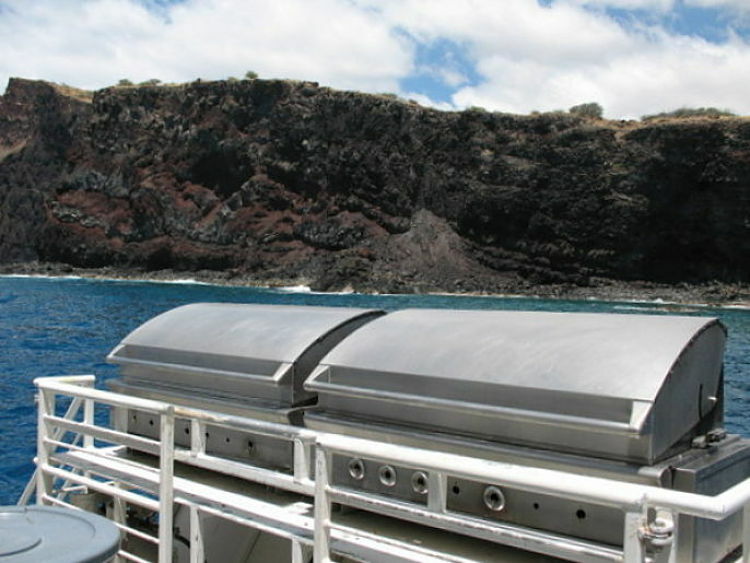 The nice thing is that you are helping to protect the environment because all profits for these cruises go to marine conservation...plus... in keeping with their conservation efforts, the catamarans are built with recycled materials and powered by Maui Biofuels. They also have special features to reduce the underwater noise. 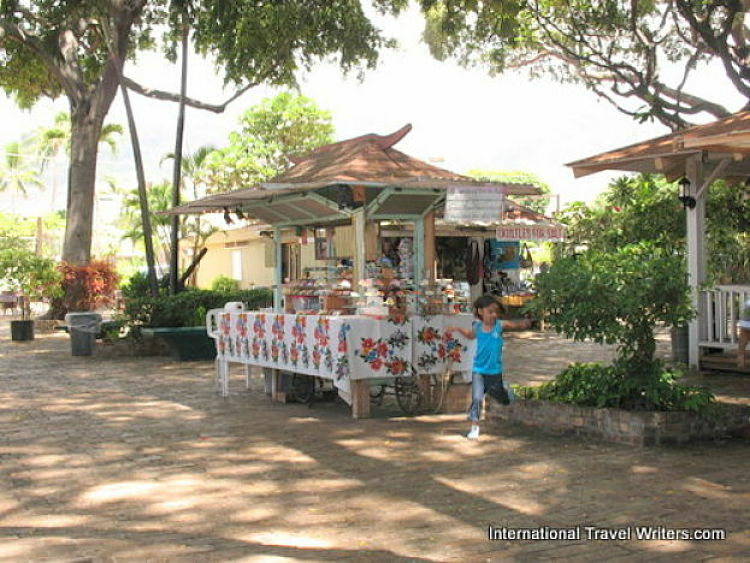 On the way to Molokini you enjoy a tropical style breakfast with freshly brewed Maui coffee and juices. For those not familiar with snorkeling a naturalist also gives a short class on the process and equipment. For lunch, they use two huge barbeques and prepare several items (teriyaki chicken tenders, hot dogs, garden burgers) so you that you have a choice...the chicken was delicious. Kaiser rolls, cookies and salads rounded out the fare. After snorkeling, on the ride back, there was complimentary beer, wine and Mai Tai's for adults and soft drinks for those that were younger. 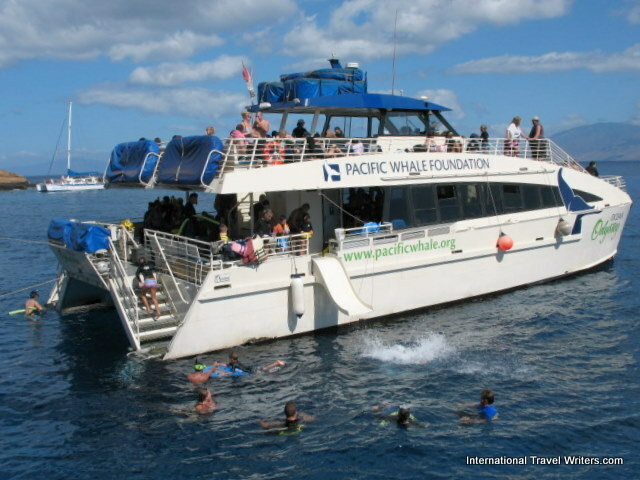 Although we had chosen a tour with Pacific Whale Foundation, there are numerous other tours available from other companies. Hawaiian Sailing Canoe Adventures has a custom built Hawaiian outrigger canoe that sails along the Wailea Coast while surfers can choose to ride the waves at Honalua Bay. For those opting to keep their feet on the ground, Hike Maui has trained guides who will lead you through the rain forest etc. while sharing their knowledge of Hawaiian botany, history and culture. Skyline Eco Adventures has five ziplines on the slopes of Haleakala Volcano or you can view cliff divers jumping off of Pu'u Kaka'a (Black Rock) which is a daily ceremony celebrating the same feat done by a former Hawaiian King. If golfing is your preference, there are many places where you can challenge your handicap at championship golf courses. 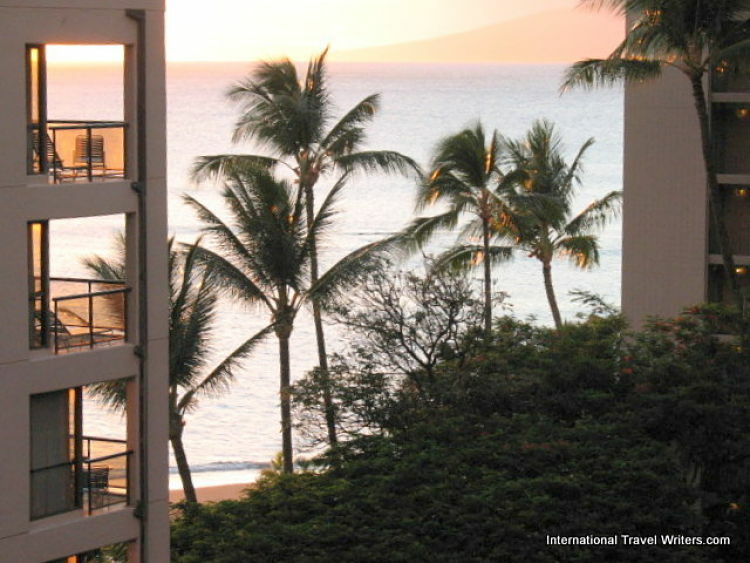 And of course, Maui has over 30 miles of beaches which includes Ka'anapali Beach, a former retreat for the royalty of Maui. You can drive to Haleakala National Park to watch the sunset at Pu'u 'Ula'ula Overlook which is more than 10,000 feet above sea level. One of the world's most spectacular and scenic drives is the Road to Hana. 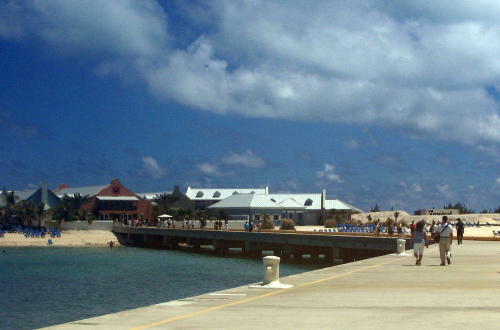 It is a 53 mile drive along the island's northeastern edge. It twists and winds past waterfalls, rocky shores, forests and you cross one lane bridges and spot taro plantations. On our tour there was an unplanned side trip because a baby octopus had attached itself to the swim platform and it was noticed after we had left the snorkeling location at Lana'i. 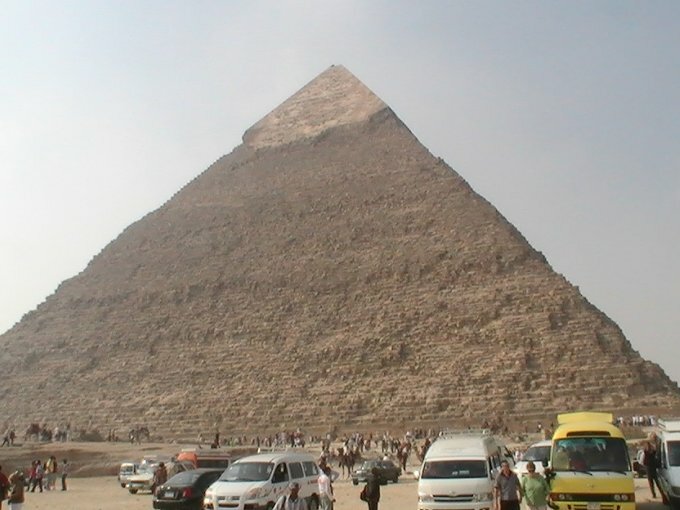 To preserve the conservation beliefs of the Foundation, they found an area where they could set it loose and it would survive. It was a nice verification of the attempts to keep the eco system secure. The trip had lasted 6.5 hours plus our driving time back to the Ka'anapli Beach area where we were staying. We had a pleasant dinner at the hotel dining room instead of in Lahaina because all that fresh air and activity left us depleted of energy for the time being. Drinking Mai Tai's on the lanai, watching the sun starting to set, was the perfect end to a very interesting and fun day. The next day would bring a new activity. However, we may repeat the snorkel tour when we return next year (2012).